People often question that how to get rid of safe mode or How do I turn Safe Mode off? if you are looking for the same then this post is written for you. Android devices are increasingly similar to PC in their features. This is very advantageous for Android users who find that their devices are now capable of more functions than the previously released devices. The problem is that these additional features also come with an additional risk for failure. There are, however, a number of ways to circumvent these technological pitfalls. One of these ways is the Android Safe Mode. In this article, we will discuss everything about the safe mode Android. Safe mode in Android is generally the same as a safe mode on your PC. This is where the device allows you to boot the device with minimal features and drivers. Most of the time this is done to ensure that there are just enough features and drivers to load the device. It also works to extinguish third party applications. It can, therefore, be very useful when some applications are causing problems such as the instant battery leak and the screen does not respond. An Android device will usually be in safe mode if the operating system has been damaged in any way. This corruption can be the result of a flashing ROM failed, a software update failed or even a virus attack. Sometimes, some applications on your Android device may cause a system malfunction resulting from your device entering safe mode. To back up your Android data, please download the program from the link above for a free trial and install it on your PC/Laptop. Then, follow the step by step guide below. First, run the program on your computer after you install it. The program offers multiple features. You can view them from the main window below. Plug your Android device into the computer. When it is detected by the computer, choose “save your phone” from the main window of the program, and you will see the window below appears. You can choose any type of file you need to backup. Check them and click “Start Transfer” to begin. Then the program will do the rest of the work for you. Wait for the success message. Point to be Noted: You can use the “Restore from backup” function to restore the backup file to your device when you need it later. Now that we have successfully backed up your device, we can now safely start the Android device in safe mode. These simple steps should help you to do this very easily. Step 1: Press and hold the power button for a few seconds until Android invites you to turn it off as it would normally. Step 2: Press and hold “Turn Off” for a few seconds until the phone asks if you want to enter Safe Mode. Once in safe mode, you can easily solve any problems that your Android device may be exposing. 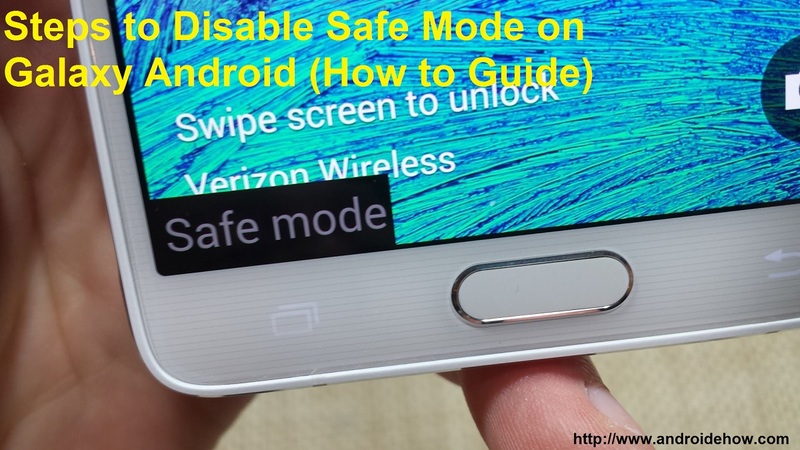 to remove safe mode on the Android phone the following simple steps should make it easy for you. Step 1: Drag down the notification panel on your device, and then tap the “Safe Mode” notification. Step 2: Click OK in the window that appears and your device safely will exit Safe Mode. Part 6. What if the safe mode will not be cut on the Android device? Sometimes, safe mode on your Android device will not be turned off with the process described in Part 5 above. This is a fairly common experience for most people, there are a few things you can do to solve the problem. If the device always starts in safe mode, uninstall all applications that have recently been downloaded. Restart the device and do not reinstall applications if the problem is resolved. Now you know all there is to know about the safe mode Android. This information should be very useful when you are having problems with your Android device and also will help you get into safe mode and get out easily.